The rate of health care cost growth is tangential to Social Security but extremely important to Medicare and Medicaid spending, the overall budget, and private sector health care costs. Fogel's paper is also relevant to my recent paper on the relative contributions of health care cost growth and aging to overall entitlement spending increases. (Also see this blog post for more details.) In the paper, I noted that increases in health care costs ("excess cost growth") are more uncertain than costs associated with aging and cited an academic paper by several actuaries at CMS that concluded that excess cost growth will be significantly lower than CBO and the Medicare Trustees project. (This would make aging the dominant cost-driver over the long term.) Fogel's article also points to lower rates of health care cost growth. For instance, he projects that total spending on health care will rise to 29 percent of GDP in 2040, versus 38 percent in CBO projections. None of this is to imply that controlling health spending isn't very important; it is. But I do think that folks who say we have a health care cost problem and nothing else are missing the important contributions of population aging to long-term entitlement costs. Under the plan specifications described below the Social Security program would be expected to be solvent and to meet its benefit obligations throughout the long range period 2008 through 2082. The long-range OASDI actuarial deficit of 1.70 percent of payroll and the OASDI long-range unfunded obligation of $4.3 trillion in present value would be eliminated. In addition, trust fund assets expressed as a percentage of annual program cost are projected to be rising at the end of the 75-year period. Thus, the proposal meets the long-range criteria for sustainable solvency and the program would be expected to remain solvent for the foreseeable future. Click here to read the whole memo. David Walker, the head of the Peter G. Peterson Foundation and former Comptroller General, writes in the Financial Times about the parallels between the current financial crisis and the long-term fiscal gap facing the U.S. government. Beyond the turmoil for banks and homeowners, however, there is a super-sub-prime crisis brewing in Washington. Our fiscal policies have created a disconnect between today's citizens and future taxpayers. Today's taxpayers benefit from high government spending and low taxes, while future generations are expected to pay the bill. Our real challenge is where we are headed on our do-nothing fiscal path. Washington has charged everything to the nation's credit card - engaging in tax cuts and spending increases without paying for them. Washington's imprudent, unethical and even immoral behaviour is facilitated by a lack of transparency. For example, as of September 30, 2007 the federal government was in a $53,000bn dollar fiscal hole, equal to $455,000 per household and $175,000 per person. This burden is rising every year by $6,600-$9,900 per American. Medicare represents $34,000bn of this deficit and the related Medicare trust fund is set to run dry within 10 years. The Social Security programme is projected to have negative cash flow within about 10 years. What needs to be done? First, we need leadership from the presidential candidates and members of Congress. We need to re-impose tough budget controls, constrain federal spending, decide which Bush tax cuts will stay, and engage in comprehensive reform of our entitlement, healthcare and tax systems. A bipartisan commission that would make recommendations for an up-or-down vote by Congress would be a positive step to making this a reality. Money Magazine's Janice Revel writes on how individuals should think about Social Security and Medicare reform in the context of their own financial planning. This is an important side of reform that's often neglected, and points to why reform should take place sooner rather than later. Social Security and Medicare reform will inevitably involve significant changes to taxes and benefits, but it is difficult for individuals to make financial plans for retirement in the absence of information regarding what these tax/benefit changes will be. This uncertainty cost associated with delayed action isn't quantified, but for individuals it has to be significant. Obama will protect Social Security benefits for current and future beneficiaries alike. And he does not believe it is necessary or fair to hardworking seniors to raise the retirement age. Obama is strongly opposed to privatizing Social Security. Obama believes that the first place to look for ways to strengthen Social Security is the payroll tax system. Currently, the Social Security payroll tax applies to only the first $97,500 a worker makes. Obama supports increasing the maximum amount of earnings covered by Social Security and he will work with Congress and the American people to choose a payroll tax reform package that will keep Social Security solvent for at least the next half century. They will work with members of Congress from both parties to strengthen Social Security and prevent privatization while protecting middle class families from tax increases or benefit cuts. As part of a bipartisan plan that would be phased in over many years, they will ask those making over $250,000 to contribute a bit more to Social Security to keep it sound. Obama does not support uncapping the full payroll tax of 12.4 percent rate. Instead, he and Joe Biden are considering plans that would ask those making over $250,000 to pay in the range of 2 to 4 percent more in total (combined employer and employee). Among other things, what's missing? "He does not believe it is necessary or fair to hardworking seniors to raise the retirement age." If true, I'm glad Obama is showing some flexibility, given how little of the long-term problem his current tax plan would address. But given the election season, this may be another example of no good deed going unpunished. Certainly, had McCain made a similar change the opposition and the press would be all over it. The Brookings Institution's Henry Aaron argues that recent market declines provide a lesson, that being not to have personal accounts as part of Social Security. So, picture this imaginary future. President Bush's partial privatization plan was enacted. People have been socking away funds in individual accounts for years. Social Security benefits have eroded continuously, as was inevitable under President Bush's plan. People will have adjusted their consumption and savings to leave themselves with savings that they expect to be sufficient for retirement. Then, bang! After people have retired or become disabled, or just on the eve of claiming benefits, a financial panic they could not possibly have anticipated strikes. Even worse, stock prices collapse as much as they did in 2001 when over-the-counter shares fell roughly 80 percent and the New York Stock exchange fell by more than 40 percent. Those are the assets in which private accounts were invested. Retirement income, once thought adequate, becomes insufficient. To be sure, Social Security benefits would remain, as they are today, rock solid. But under the typical privatization plan, they would provide much less of retirement income than they do today. The financial crisis would become a personal calamity for tens of millions of retired baby-boomers and their successors. To be sure, current market conditions aren't what you would use to advertize personal retirement accounts. People retiring today have had to weather both the current sub-prime crisis as well as the unwinding of the tech bubble earlier in the decade. That said, I'm wary of generalizations like this lacking numbers. I'm working to put numbers to these questions and suspect they may tell a somewhat different story. Many of Social Security's features were designed around a view of the economy and the family that is at least three-quarters of a century old. Congress spends tens of billions more every single year for the program, but few of those extra dollars address the needs of the poor or very old. Meanwhile, the program discourages work at a time when the labor force is growing at a slower pace, and it discriminates strongly against single parents, usually women. I concur strongly with Gene's overall point: solvency is a necessary condition for a successful reform, but not sufficient. There are many other ways in which the program can be improved, particularly along the lines he highlights. The whole article is well worth reading. There is a fair argument to be had about the wisdom of having workers invest part of their Social Security taxes in private accounts. This year's plunge buttresses the contention that such accounts are too risky to comprise even part of what was conceived, after all, to serve as a safety net. But Obama's cartoon version of private accounts is not what Bush suggested, and it certainly is not something being peddled by McCain now. In the closing weeks of a campaign when every advantage counts it's hard for either side to hold back. Understandable given what's at stake, but it doesn't make it easier to get things done afterwards. Following up on Thursday's post regarding Sen. Obama's ad attacking Sen. McCain for support of adding personal retirement accounts to Social Security, FactCheck.org has an extended discussion of the claims made in the ad. I called one of the ad's claims – that McCain supported cutting benefits in half – "a big stretch." FactCheck went a bit further, calling it a "rank misrepresentation." Nobody now getting benefits, or even close to retirement, would have seen any reduction in benefits or cost-of-living adjustments under the plan Bush proposed in April, 2005. What Bush proposed – in addition to creating private Social Security accounts – was to hold down the growth of benefits received by those retiring in the future. He embraced a proposal for "progressive price indexing" of future benefits. This would have been a "cut" only in relation to what the current formula would produce for future retirees, assuming that taxes are increased sufficiently to keep the system going. The "price indexing" would have tied the growth to the rate of price inflation, rather than to the growth of wages, as is the case now. Wages have historically risen faster than prices, so the current wage-indexed system pushes benefits for future retirees up faster than the rate of inflation. The "progressive" part would have held down the growth only for higher-income and middle-income workers, while allowing benefits for lower-income workers to rise in line with the current wage-based formula. The Obama-Biden campaign attempts to document their "cutting benefits in half" claim by citing a report by the Center on Budget and Policy Priorities written by Jason Furman, who is currently one of Obama's top economic advisers. This won't do. What Furman's study actually says is quite different from what the ad claims. Furman's report says that the "progressive price indexing" plan Bush supported would result in benefits for the average worker who retires in 2075 that are 28 percent lower than under the current formula. Obviously 28 percent is not "half." The Obama-Biden campaign notes that Furman's paper also says that full price indexing of benefits – even for low-income workers – would result in benefits 49 percent lower than the current formula in 2075. But that's not the plan Bush supported, and we find no evidence that McCain ever supported it either. We asked the Obama campaign to show us where McCain has ever supported full price indexing of benefits, but so far they have not done so. The full FactCheck analysis is worth reading, not simply with reference to Obama ad but also in terms of general discussion of reform. Often seemingly straightforward claims by both sides aren't what they appear in the Social Security context, but usually this gets glossed over in campaign season. Given the claims in Obama's ad, it's also worth checking out this post on the GOP platform on Social Security reform, which seemed to me was backing away from "carve out" accounts funded out of the existing 12.4 percent payroll tax and toward "add on" accounts that would supplement existing funding. In addition, comments McCain made to an AARP conference in early September also indicate a shift away from carve out accounts. He said, "There may be a role for private investment accounts for younger workers as long as they are not a substitute for insuring the solvency of the system and does not affect the system." The final (grammatically challenged) clause seems a further move away from carve out accounts, which would affect Social Security's financing lacking additional "offsets" to traditional benefits for account holders. "Imagine Bear Stearns, Lehman Brothers (LEH), American International Group (AIG), and other titans of finance managing Social Security?" Well, me neither, because Bear Stearns and Lehman Brothers were primarily investment banks and AIG is an insurance company. None of the three would have been called on to manage Social Security accounts. Moreover, even if a firm that did manage accounts went bankrupt the assets held by customers are distinct from the assets of the firm. In other words, you might lose money if the stocks in your account fall, but you won't lose money if the company managing the accounts goes under. Finally, under all personal account-based reform plans I can think of, accounts would be administered by a quasi-governmental agency, not a private firm. "To be clear, the democratization of stock ownership is a welcome and powerful trend." Except, apparently, for the purposes of retirement saving. Are there other savings goals where stockholding is more appropriate – a down payment on a house, or your children's education? In both cases these have much shorter time horizons, which make the risk of holding stocks larger. Note here that Farrell isn't simply arguing that stocks are a bad idea for Social Security but apparently a bad deal for all ordinary investors. "The standard advice that individuals fare best when they turn over their money to professional money managers is wrong. It's a bromide guaranteed to lose individuals money, with much scholarly evidence that actively managed mutual funds systematically underperform passively constructed index funds." Which is exactly why all personal account reform plans would base their investment options on index funds. "Swensen called for government to act 'in loco parentis' and create powerful incentives for companies to put their employees into passively managed well-diversified portfolios, perhaps similar to the low cost, broad-based, limited-choice offerings of the Federal Thrift Plan. But other ideas are worth pursuing. For instance, why not attach to every Social Security number an account consisting of a 60% equity index fund and a 40% Treasury Inflation Protected Securities portfolio? The retirement savings plan would essentially do as well—or as poorly—as the U.S. economy." Um, this is exactly what most reform plans actually do. Farrell is undoubtedly a smart guy and points out many of the well-known hurdles individual investors face in planning for retirement in a Defined Contribution world. Those hurdles aren't to be underestimated and policies to overcome them – such as auto-enrollment in 401(k) plans and default life cycle portfolios holding index funds – should continue to be pursued. But you're not doing a service to your readers in presenting a caricature of the policy you're looking to critique. The claim 'cutting benefits in half' is a big stretch. President Bush's proposal for 'progressive indexing' would have addressed about half the long-term deficit – that's a lot different than cutting benefits in half. But we're in an election year so these kinds of claims by either side shouldn't be all that surprising. The Urban Institute today released a new report on how to conduct distributional analysis of retirement income, based on an expert panel that met back in April. I was a part of the panel, based on having worked with Social Security's MINT model during my time at SSA. The other members of the panel were Gary Burtless, The Brookings Institution; Stephen Goss, Social Security Administration; Joyce Manchester, Congressional Budget Office; and Paul van de Water, Center on Budget and Policy Priorities. A number of analysts from the Urban Institute took part, including Eric Toder, who organized the meeting; Barbara Butrica; Melissa Favreault; Gordon Mermin; Karen Smith; Eugene Steuerle; Roberton Williams; and Sheila Zedlewski. Urban's distributional work is already top-notch, but it's a good sign that they're continually re-evaluating their methods. The report is on the wonky side, but it reflects the important methodological choices analysts have to make and how these choices can alter how we view a given set of data. Click here for the full report. The Social Security Administration has released a new edition of Fast Facts and Figures About Social Security. It's full of facts and figures and, yes, it's also quite fast. Get it here. The Social Security Administration has released an updated version of its guidebook Social Security Programs Around the World, Europe. (Volumes relating to Europe, the Americas, Asia and Africa are issued at six-month intervals.) You can access the new edition here. Melinda Beeuwkes Buntin and Susann Rohwedder of the RAND Corporation are authors of a new article on Social Security and Medicare – the "aging couple." The plight of the Social Security trust fund is well known. Outflows are projected to exceed inflows beginning in 2017; without corrective action, the trust fund will be depleted by 2041. But the Medicare trust fund is in worse shape: Outflows will begin to exceed inflows this year, and projections indicate that it will be exhausted by 2019 (see the figure). More worrisome still, these projections may actually understate the extent of Medicare's funding problems. Health care costs have historically grown faster and less predictably than general inflation. This means that the Medicare trust fund could expire even sooner than most economists are projecting and that modest adjustments to taxes or benefits won't bring the fund into balance. What has brought on this double-barreled funding crisis? Two factors stand out. First, Americans are living longer. Men reaching retirement at age 65 today typically look forward to a further 17 years of retirement, compared with fewer than 13 years back in 1965. The result is that retirees are receiving Social Security and Medicare benefits for far longer than the designers of the program ever envisioned. But more important, the cost of health care has increased rapidly, thanks largely to the pace of technological innovation. Social Security and Medicare's looming budget shortfalls pose real problems. But any problem caused by longer lives and medical breakthroughs must be approached cautiously. Social Security and Medicare's financial problems are real, but so are their achievements: historic reductions in poverty among seniors, greater longevity, and the provision of cutting-edge medical technology to seniors. The challenge for policymakers is to address the two programs' financial problems while building on these gains. New paper: Is Social Security Part of the Social Safety Net? Early architects of the Social Security program clearly intended to "prevent destitution and dependency" of the elderly. Indeed, Social Security is the only income for many elderly individuals with no pension and no wealth. On the basis of annual income, Coronado et al (2000) show that Social Security dramatically reduces inequality. On the basis of lifetime income, however, they show that effects are ambiguous. Social Security does not clearly increase lifetime income equality, as measured by the Gini Coefficient. That paper focuses on overall inequality, using 21 years of PSID data for 1800 individuals. Relative to that paper, we make several contributions. First, we extend the data to 26 years for 6,000 individuals. Second, we update various procedures and definitions. Third, we focus not on overall inequality, but on how Social Security affects the poor. This question is important, because a Social Security program that reduces inequality by redistributing from high income individuals to middle income individuals may do nothing to help the poor. Fourth, we look at changes over time in the extent to which Social Security helps the poor. For this analysis, we use the PSID to develop a large sample of individuals born at different times. Second, we construct an entire lifetime earnings history for each individual, and we develop several measures by which to classify each of them from rich to poor. Third, we calculate each individual's social security taxes and retirement benefits. Fourth, we use several alternative measures of the impact of this program on "the poor". We have four major findings. First, as we expand the definition of income to use a more comprehensive measure, we find that Social Security does less overall to help the poor. Indeed, when we use an "endowment" defined by potential labor earnings at the household level, rather than actual earnings at the individual level, we find that Social Security has virtually no effect on overall inequality. Second, we find that this result is driven largely by the lack of redistribution across the middle and upper part of the income distribution, so it masks some small positive net transfers to the bottom lifetime income quintile. Third, in cases where redistribution does occur, we find it is not efficiently targeted: many high income households receive positive net transfers, while many low income households pay net taxes. Finally, the effect of social security changes over time, and these changes depend on the income concept used to classify someone as "poor". Thus, Social Security has little effect, and changes over time are ambiguous. I've been doing some work on the "targeting" of Social Security progressivity, which touches on some similar issues to the Brown, Fullerton, Coronado paper. I hope to preview it here in the new few weeks. Also, Don Fullerton is the co-author an AEI book, Income Redistribution from Social Security, which is available (for free!) here. This paper investigates the impact on labor supply of changes in the Social Security earnings test in 1996 and 2000. We highlight how inertia in labor supply choices influences responses to policy changes. We do this in two ways. First, we show that taking account of last year's employment status is important in estimating responses to current earnings test changes, a step that has not always been taken in the literature. Second, we test the effect of not only actual but also anticipated earnings test parameters which cohorts faced at earlier ages. This approach demonstrates that past and anticipated future rules influence current employment and earnings. Thus, we identify an impact of earnings test changes on employment at ages that are younger than those directly affected and in years that follow the direct change. Lastly, we show that earnings test changes that were initiated in 1996 had an effect, in addition to the changes in 2000 that have been recently studied by others. Overall, we predict that the elimination of the earnings test in 2000 raised employment among Health and Retirement Study respondents by around two percentage points at ages 66-69 and 3.5 points at age 65, with gains persisting as exposed cohorts aged and also being observed at younger ages due to the shock to anticipated earnings test rules. One important issue with how the earnings test affects labor supply is whether Social Security participants correctly understand that benefits lost to the earnings test will be made up with benefit increases once they reach the full retirement age. Friedberg and Webb argue (correctly, I believe) that most participants don't understand how the earnings test works. I wrote on this aspect of the earnings test here. Recently I authored a Health Policy Outlook for AEI that looked at the relative roles of aging and per capita health care cost increases – called 'excess cost growth' – in driving increases in overall entitlement spending. The piece took on a increasingly common view that excess cost growth is really the only player in the entitlement game, making Social Security reform and policy issues regarding population aging seemingly irrelevant. New York Times columnist Paul Krugman, for instance, wrote that "the whole Beltway obsession with the fiscal burden of an aging population is misguided." Krugman and others cited a November 2007 CBO report as evidence; the report contained a chart showing that over the next 75 years almost 9 out of every 10 dollars in increased Medicare and Medicaid spending would be driven by excess cost growth, not population aging. 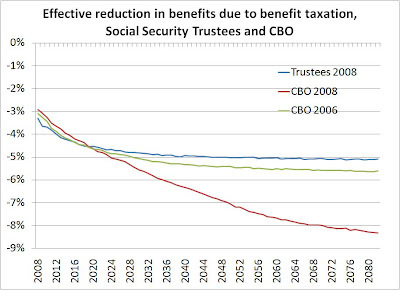 This graph got my attention when it was featured in a blog post from Mark Thoma entitled "It's Not Social Security. "Here's my recreation of the original CBO Medicare/Medicaid chart. Now, for the correction: in my article, I quoted an op-ed from CBO Director Peter Orszag that appeared in the Wall Street Journal in December, 2007 in which he said "The fiscal gap does not arise, as many believe, primarily from the coming retirement of the baby boomers. Rather, the rate at which health-care costs grow will be the primary determinant of the nation's long-term budget picture." In my article, I pointed out that you could not infer this conclusion from the November 2007 CBO study because it did not include Social Security and did not express cost increases in present value form. However, in subsequent conversations it was pointed out to me Orszag's op-ed was referring to CBO's December 2007 Long Term Budget Outlook, in which the fiscal gap for the entire government, including Social Security, was calculated. This mischaracterization was an error on my part which I should have caught, and I regret not doing so. Here's a chart that attributes to aging and excess cost growth their proportionate shares of the interactions between the two, and uses CBO's "approach 3" from their May policy brief to account for effects on GDP. Now here's an additional chart using the same methods, except that it adds to aging's share cost increases attributable to Social Security. As you can see, this is moving away from the original chart from which outside commentators drew so many conclusions. The point of these calculations isn't to show that aging is the primary cost driver of future entitlement spending; rather, it is simply to rebut the argument that aging is a bit-player in total entitlement spending – in other words, to show that concern over an aging population isn't misguided. Moreover, these numbers don't lead to the conclusion that we need less research on health care cost growth. Population aging, and the potential policy responses to it, have been much-studied and are well understood, why the drivers of health care cost growth and the relationship between health care cost and quality are much less well understood. What the results do show, which is what I argued in the original piece, was that we need continued research and policy work on both fronts. Click here to download a spreadsheet containing these figures. PensionReforms.com, a New Zealand-based website that tracks pension reform around the globe (and has a soft spot for universal pensions, something I'm getting interested in as well…) has a commentary on the 2008 Social Security Trustees Report, though the filter of a summary by Alicia Munnell at the Center for Retirement Research at Boston College. Worth a read, and PensionReform.com is definitely worth following for those interested in what's going on around the world. "Sarah Palin, talking about domestic policy with ABC's Charles Gibson in his second day of exclusive access on Friday, seemed confused about entitlement programs -- and unaware that Congress has little say in significantly reducing the costs of Social Security, Medicaid and Medicare. When she seemed to equate these entitlement programs to agencies "where we can find efficiencies in every department" Gibson lectured her that agencies are not involved in entitlements." Let's repeat part of that paragraph and ask again who is confused: "Congress has little say in significantly reducing the costs of Social Security, Medicaid and Medicare." Entitlement programs are not imposed on the country by a foreign power, such that we can't change their form and structure any time Congress chooses to do so. Entitlements differ only in terms of having pre-appropriated funds that do not have to be re-approved by Congress each year. But Congress has changed Social Security to reduce costs in several major reforms, and alters Medicare and Medicaid on a far more frequent basis. It's by acting as if they have no control over entitlements that Congresses and presidents have allowed their problems to grow so large. If nothing else, clearing up this "confusion" would be a big step toward taking responsibility for the future of these programs. In this post discussing the new CBO projections for Social Security financing, I noted that one big change relative to the Trustees approach and to prior CBO practice was to assume a literal "current law" approach to income tax policy. Current law for income taxes implies that the Bush tax cuts expire over the next several years, the AMT remains un-indexed for inflation, and "real bracket creep" pushes more and more taxpayers into higher tax brackets. (See this op-ed for discussion of this topic.) This is a major issue for income tax policy, but also affects Social Security because the program derives part of its revenues from income taxes levied on retirement benefits. These flow back to Social Security to help finance benefits. While the formula is complex, roughly speaking individuals with incomes greater than $25,000 may have to pay income taxes on part of their Social Security benefits. Currently, around one third of retirees pay taxes on their Social Security benefits. The Social Security Trustees assume that income taxes will remain roughly constant relative to GDP, which is consistent with how Congress has tended to modify taxes in the past. However, revenue from benefit taxation will rise, because the $25,000 income exclusion isn't indexed to inflation. As a result, a larger share of retirees in the future will pay taxes on their benefits. So both CBO and the Trustees correctly project that more retirees will pay taxes on their benefits, but CBO differs in assuming that the tax rates retirees pay will also increase significantly. One way of illustrating this difference is to treat the taxation of retirement benefits as a de facto reduction or means test of benefits. Today, revenues from benefit taxation equal around 0.35% of taxable payroll while benefit payments equal around 11% of payroll. So the taxation of benefits can be treated as around a 3% reduction in the average retirement benefit. The chart below shows the size of the effective reduction in average retirement benefits going forward, under 2008 Trustees projections, 2008 CBO projections and 2006 CBO projections (the last full projection done prior to 2008). Under Trustees projections and the 2006 CBO projections, which followed the Trustees practice of assuming that income taxes remain steady relative to GDP, benefit taxation rises from around 3.3% of average benefits to around 5-5.5% of average benefits over 75 years. Under the new CBO projections, which assume that future average income tax rates will be almost double those of today's, benefit taxation amounts to over 8 percent of total benefits. This increase improves the CBO 75-year actuarial balance projections by around 0.24% of taxable payroll, or around 18.5%. The point of all this is simply that this methodological change is consistent with the literal reading of current law and with CBO practice in other documents, but is also probably not anyone's "best guess" of what will actually happen in the future. When we think qualitatively about the size of the future Social Security shortfall, this methodological choice should be borne in mind. Can Europe’s fertility rate recover? An interesting post over at VoxEU looking at European fertility over time. They argue that Europe has had very low fertility rates before – back in the 1930s – but birth rates eventually recovered to a higher pace. Can this happen again? "European countries may still be able to fend off their feared extinction by encouraging higher fertility levels. But rather than trying to recreate the conditions that fuelled the post-war baby boom, their policies should be geared towards making childbearing, and parenting, compatible with the 21st century reality of greater equality in economic opportunities for women and men." Read the full post here. The RAND Corporation released a new working paper by Emma Aguila entitled "Personal retirement accounts and saving," which examines the degree to which individuals given personal retirement accounts as part of Social Security reform might reduce their other retirement saving. Aguila used the Mexican social security reforms, in which only part of the population was enrolled in personal accounts, to analyze how account holders and non-account holders changed their saving habits after the accounts were put in place. Aguila found that a significant portion of the new saving in personal accounts was offset by reduced retirement savings outside of the pension system. To the degree that account holders reduce their other saving the accounts have not accomplished their primary goal, which is to build assets to prefund future retirement income. Click here to download the paper. What does the GOP platform say on Social Security? I expected nothing of real interest regarding Social Security in the Republican Party platform, mostly for the reason that I expect nothing of real interest regarding anything in any party platform. But the section on Social Security reform in the 2008 GOP platform ended with some language that was interesting for its ambiguity. Social Security: We are committed to putting Social Security on a sound fiscal basis. Our society faces a profound demographic shift over the next twenty-five years, from today's ratio of 3.3 workers for every retiree to only 2.1 workers by 2034. Under the current system, younger workers will not be able to depend on Social Security as part of their retirement plan. We believe the solution should give workers control over, and a fair return on, their contributions. No changes in the system should adversely affect any current or near-retiree. Comprehensive reform should include the opportunity to freely choose to create your own personal investment accounts which are distinct from and supplemental to the overall Social Security system. Note what the last sentence doesn't say: it doesn't say that the accounts would be funded out of existing payroll taxes – a so-called "carve out" account – and it doesn't say that the accounts would be integrated into Social Security. In fact, it says that accounts would be "distinct from and supplemental to" Social Security. These statements seem to contain some wiggle room to allow for "add on" accounts that might be passed alongside Social Security reform yet not be built into the Social Security program itself. If so, this may be a significant step in moving toward compromise on Social Security. The Baltimore Sun's Dan Thanh Dang points readers to the Academy of Actuaries' online Social Security reform game, which allows users to choose from a menu of common options to fix Social Security. Click here to give it a try! And securing your future starts with protecting Social Security – today, tomorrow and forever. Now, John McCain said that the way Social Security works is, and I quote, "an absolute disgrace." Wrong. For millions of Americans, it's the very difference between a comfortable retirement and falling into poverty. More than half of seniors depend on it for more than half of their income. And as the first baby boomers become eligible for benefits this year, there are steps we can take to secure its future for generations to come. That doesn't mean embracing George Bush's failed privatization scheme, as John McCain has. Privatizing Social Security was a bad idea when George Bush proposed it, and it's a bad idea today. It would take the one rock-solid, guaranteed part of your retirement income and gamble it on the stock market. That's why I stood with AARP against this plan in the Senate, and that's why I won't stand for it as President. But his campaign has gone even further, suggesting that the best answer to the growing pressures on Social Security might be to cut cost-of-living adjustments or raise the retirement age. I will not do either. There's another option that is fairer to working men and women without putting the burden on those who have already earned it. Right now, the Social Security payroll tax is capped. That means most middle-class families pay this tax on every dime they make, while millionaires and billionaires only pay it on a very small percentage of their income. That's why I'll work with members of Congress from both parties to ask people making more than $250,000 a year to contribute a little bit more to keep the system sound. It's a change that would start a decade or more from now, and it won't burden middle-class families. In fact, 99% of Americans will see absolutely no change in their taxes – 99%. Pretty standard stuff on Social Security though, as always, I wonder how it will all add up. Now, even if we keep Social Security strong for future generations, it's still not enough to help seniors on fixed incomes who are struggling with the rising cost of everything from gas to groceries. That's why I'll make retirement more secure by eliminating income taxes for retirees making less than $50,000 per year. This would completely eliminate income taxes for 7 million seniors. Actually, there are currently very few seniors living on truly "fixed incomes." This phrase gained prominence in the 1960s and 1970s, when Social Security benefits were adjusted for inflation only periodically. A large increase in inflation could entail a significant reduction in the buying power of retirees' pensions. Today, however, Social Security benefits are adjusted annually for changes in the Consumer Price Index. While rising prices would have a temporary impact on seniors' purchasing power, Cost of Living Adjustments would account for price increases each year. (And, in the view of many economists, over-adjust for inflation on a regular basis.) My admittedly biased view is that Obama's tax proposal for seniors is more geared to impressing a group with which Obama polls poorly than addressing a problem that truly stands out more than those for other Americans. How will Social Security progressivity change under Obama plan? There are a number of ways to analyze progressivity, but the approach here may be easy to understand. Using the Policy Simulation Group's models, I simulated the Obama proposal for the 1990 birth cohort, so that they would live almost their entire working lives under the new plan. I divide the population into ten deciles based on their level of lifetime earnings. For each decile, I measure the percentage of total taxes they pay and the percentage of total benefits they receive. Low earners pay a much smaller percentage of taxes than benefits they receive, due to the progressivity of the benefit formula. At the high end, the pattern is reversed. The Obama proposal would affect only high earning individuals. While a very small percentage of individuals earn over $250,000 per year, they are not the same individuals in each year so a somewhat larger percentage of individuals would be affected. Nevertheless, it's really in the top 10% of the earnings distribution where the effects are felt. Under current law, the top 10% of lifetime earners pay around 18.2% of total taxes, but receive only around 15.0% of total benefits. Again, this is due to the progressivity of the benefit formula. Under the Obama proposal benefits would not change, so the top 10% would continue to receive 15.0% of total benefits. However, their share of the total tax burden would rise to 19.4%. Again, note that the Obama proposal would fix only around 15% of the long-term deficit, so other changes would be needed in addition to those shown here. The principal fiscal challenge arising from private accounts would be the so-called transition cost, which is financing Social Security benefits for current beneficiaries while current workers are shifting tax payments into private accounts. There is no escaping this budget pain. However, under my proposed reform - with a quick shift to private accounts and phasing new workers out of Social Security entirely - costs peak early and begin to diminish, in contrast to the present system, in which the red ink explodes and never ends. Benefit cuts are undesirable, but trimming payments is more fair than hiking taxes, which would only exacerbate the system's existing infirmities. First, we should adjust wage indexation, which increases benefits faster than inflation. Second, we should raise the retirement age, since life expectancy has increased by 18 years since 1935.Third, we should consider other benefit adjustments, such as fixing the consumer price index, which overstates the impact of inflation. Other spending cuts - in corporate welfare, nonessential domestic programs, and military outlays for defending everyone but the U.S. - also will be necessary. If these reductions are insufficient to fully fund the transition, it might be necessary to consider short-term borrowing. Though not desirable, these obligations would be more than counterbalanced by eliminating today's massive unfunded liabilities as a result of moving to a self-funded system. Say what you will, Barr has proposed a more complete and specific Social Security plan than either of the main party candidates. (I guess you can afford to speak your mind when you're not expecting to win…) In any case, click here to read the whole article.